Modern society cannot function without a reliable power system. We need energy for all our activities, and we utilize this energy in various forms such as thermal, electrical, mechanical etc. However, electrical energy can be considered as the most important of these since we can generate, transmit, distribute, convert and utilize it efficiently and economically. The generation aspect is at the foremost of the chain and it is realized with the help of power plants. A set of equipments utilized to produce electrical power in large quantities (usually hundreds - thousands of MW) is called a generating station or a power plant. Such a power plant will convert one form of energy (nuclear, thermal, hydro, solar etc.) to electrical energy. However, they represent only a small part of the global scheme in terms of capacity and utilization. Principle of operation: It works on Modified Rankine Cycle. Location: It is located at a site where coal, water and transportation facilities are available easily. It is located near load centers. Requirement of Space: Need a large space due to coal storage, turbine, boiler and other auxiliaries. Fuel Used: Coal (mostly) or oil. Availability of Fuel: Coal reserves are present all over the world. However, coal is non-renewable and limited. Cost of Fuel: High. Coal is heavy and has to be transported to the plant. 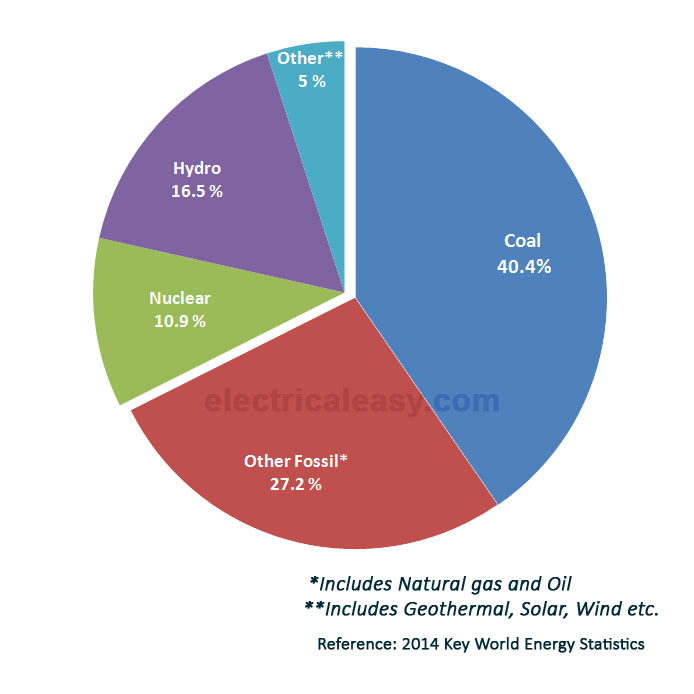 Initial Cost of Plant: Lower than Hydroelectric and Nuclear power plants. Running Costs: Higher than Hydroelectric and Nuclear power plants. Maintenance Costs: High. Skilled engineers and staff are needed. Transmission and Distribution Cost: Low. It is usually located near load centers. Start-up Power: About 10% of unit capacity. Standby Losses: More than hydroelectric and nuclear power plants. Boiler flame has to be kept burning, so some amount of coal is used constantly, even when the turbine is not in operation. Cleanliness: Less clean. Smoke and ash are produced. Environmental Considerations: Air pollution occurs and leads to acid rain. Greenhouse gases are also produced. Life Time: 30 - 40 years. Principle of operation: Potential energy of water is converted to Kinetic energy and used to rotate a turbine. Location: Located where a large amount of water can be collected easily in a reservoir by constructing a dam. Usually in a hilly area at high altitude. Requirement of Space: Very large space required. A dam is huge. Cost of Fuel: Water is free. Initial Cost of Plant: Very high. Construction of a dam and reservoir is expensive. Running Costs: Zero, because no fuel is needed. Transmission and Distribution Cost: High. It is located in remote areas, away from load centers. Start-up Power: 0.5% to 1% of unit capacity. Starting time: Low. Can be started instantly. Environmental Considerations: Affects marine life. People in the region have to be relocated. Principle of operation: Thermonuclear fission. Location: Located away from heavily populated areas. Requirement of Space: Requires minimum space compared to other plants of the same capacity. Fuel Used: Uranium (U235) and other radioactive metals. Availability of Fuel: Deposits of nuclear fuel are present all over the world. Also, uranium can be extracted from sea water, but it’s a complicated and complex process. Cost of Fuel: Fuel (uranium) itself isn’t too costly. However, if enriched uranium is used, then the cost of fuel increases considerably. A small amount of fuel is used, so transportation costs are less. Initial Cost of Plant: Highest. A nuclear reactor is complex and requires the most skilled engineers. Running Costs: Small amount of fuel used, so running cost is low. Maintenance Costs: Very high. Skilled personnel are needed. Transmission and Distribution Cost: Quite low. Such plants can be located near the load centers. Start-up Power: 7% to 10% of unit capacity. Starting time: Less than TPS. Can be started easily. Cleanliness: Radioactive waste is produced. Less clean than HPS. Environmental Considerations: Disposal of radioactive wastes may affect the environment, especially if it is buried underground. Underwater contamination may occur.